Our mission statement “Helping People with Intellectual Challenges Achieve their Potential” validates our commitment to serving people with disabilities. We take pride in providing the best quality services to the people we serve. Our staff is dedicated to the agency’s mission and to the principles of normalization. Here at Arc Imperial Valley, we seek inside each individual in search of his/her own potential. We set aside their disability for a moment and concentrate on the individual; working together to put forth an opportunity that would provide the highest level of satisfaction for each person we serve. 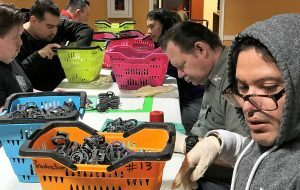 We help each program participant define their individual skills so that they can put forth their skills, while becoming independent and forming part of our active economy.